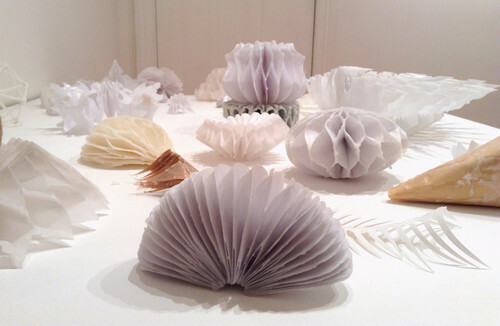 White Parazoa III is part of a series of small paper and wax sculptures inspired by the Elizabethan era. The geometric forms reference the designs of neck ruffles and lace of the period, while also referencing the appearance of cabinets of curios and the rise in scientific discoveries in the 16th-19th Centuries. The work also draws upon ideas in the illustrations of biologist Ernst Haeckel in “Art Forms of Nature” focusing on sea creatures and the array of symmetrical and geometrical patterns found in living organisms.